This ornate head piece with dangles and faux gems is an easy way to add that perfect finishing touch to your Belly Dance or Halloween costume. One adjustable size. This ornate head piece with dangles and faux gems is an easy way to add that perfect finishing touch to your Belly Dance or Halloween costume. 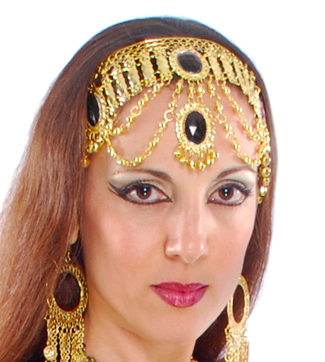 Works with any style of belly dance ensemble. One adjustable size. I bought a few of these to match my practice outfits. I am glad I did. I love them. So dramatic looking. The black & gold looks so pretty with a leopard print top and hip scarf I have.